Power Satisfaction means being at the forefront of the latest technologies and first-class equipment. 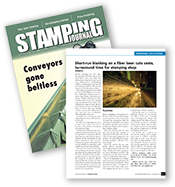 All New Stamping’s Fabrication Department offers more economical production runs with uncompromising speed and accuracy with our Fiber Laser Cutting System. As the flagship to our Fabrication Department, the sheet metal laser cutting system is completely customizable and offers a much faster, intricate and precise way to manufacture metal parts compared to an EDM or Turret press. By giving us a dramatic increase in productivity, we can now create a wider variety of prototypes and parts while our customers are waiting for production tooling to be built. The fiber laser cutting also helps us to reduce lead times on tooling and in some cases blanking dies can be eliminated. Unlike more traditional CO2 laser cutting machines, there are no moving parts or mirrors in the light-generating source for fiber laser cutting which helps reduce maintenance requirements and operating costs when comparing the fiber laser metal cutting to CO2 laser cutting services. Also, a fiber laser cutting machine offer higher speeds when cutting thin metal material and has a higher electrical efficiency compared to CO2 laser cutting. In addition, we offer finishing and assembly services. Our manufacturing processes are AS9100:2009, Rev. C and ISO 9001:2008 certified. We also adhere to NADCAP standards. Delivery of your parts can be managed using our KanBan and JIT services. Our Fiber Laser Cutting System allows us to be more expedient, economical and environmentally conscious. It is integral to the Power Satisfaction we offer our customers. about Fiber Laser Cutting System?